Computer recycling is the process of recycling computers and computer components. Such material can be put into reuse by donating to charities that greatly require the extra processing power or completely dismantling the computer systems and extracting useful components to be reused in other computing products. Dead and old computer are an invaluable source of material that is useful in computer systems. When well taken care of, they can provide much needed second-hand material while on the other hand, when poorly treated they can be a source of toxic waste that pollutes the environment. Environmental agencies all over the world have already realized that this danger is real and continues to grow rapidly. We are continuously witnessing very rapid changes in technology resulting in dumping of older systems. The prices of computing power also continues to come down steadily and yet demand continues to grow at an alarming rate. Majority of people have taken to online platforms such as eBay and Amazon to sell away old computers at affordable rates or through auctions. This is a free process available to a wide market of people and organizations seeking such equipment. Materials are put up for sale as parts or whole. People willing to buy parts can therefore get materials for other components while others looking to buy the whole system can retain the whole computer set at a reasonable price. PC owners currently have the option to ask manufacturers of their computer systems to recollect the computers or parts for a small fee and these companies then recycle the parts or refurbish the computers and put them back on the shelves for people needing cheaper alternatives. Corporations normally tend to have a more complicated computer recycling process than the regular pc user. This is because they are bound by strict government regulations to ensure that whatever computer disposal process they have at hand must have very little impact on the environment. This includes completely wiping out data from their computing systems and determining the residual value of the components before seeking a means of disposal. These companies can therefore outsource large recycling agencies to handle the processes of recycling. This is cheaper and manageable because of the volume of material available for recycling. 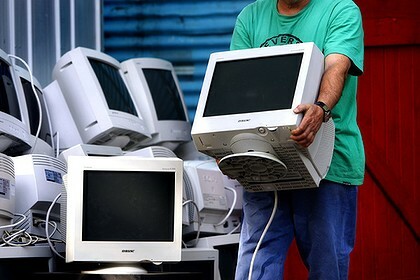 Small consumers also have the option to return computers to their manufacturers for recycling or to obtain other computer components at a cheaper rate. Normally what computer manufacturers do is to provide such users a purchase coupon equal to the value of machinery that has been written off so that they can use those coupons as discounts when purchasing new machinery. Unfortunately this practice has not taken a foothold in every part of the world. Only large companies find it affordable. This involves a more elaborate process of complete breakdown of computer components and extraction of parts. Those that are found to be useful can be put away for production while those that are damaged are destroyed. Majority of scrap companies bury these materials in the earth after destruction. The disadvantage of this process is that toxic waste such as lead eventually piles and seeps away into drainage systems and if consumed can be poisonous.